Last weekend I was in a real jam - I was all out of frosting and needed to bring a cake over for a birthday party. Lucky, I had just that - jam! 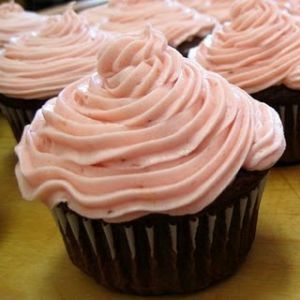 Here is a simple recipe for a Strawberry Jam Butter Cream Frosting, perfect for cakes, cupcakes, graham crackers, and more! Place butter and jam in a mixing bowl or an electric mixer fitted with a paddle attachment and cream until well incorporated, about 2 minutes. Add powdered sugar, one cup at a time, until you reach desired consistency. If frosting gets too thick you can add a little milk to thin it out. Pictured above is the frosting on Devil's Food Cake cupcakes. *If you decide to use a different brand of jam, it must be smooth, like The Red Barn's or it will not turn out correctly.